This month, you're getting this newsletter a bit late. I was in Barcelona, the beautiful capital city of Spain, for a short period. After my return, I was stuck with too many things to attend to, which caused the delay in sending out this newsletter. My apology. 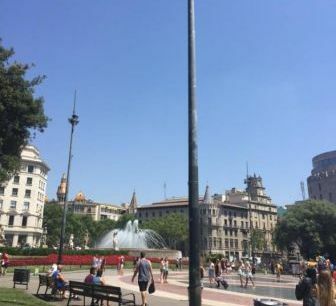 Two images are here - the first one, a street view, taken from our tour bus, and the second one - from La Rambla, a very famous tourist spot of Barcelona. Sangeetha Rathore, Jitendra Bhojwani, Hassan Hayati, Gargi Saxena, and Bhavini. A hearty welcome to you all to our group. Thanks for joining our community. 5. New items published at IWW in June 2016. _Grammarly's Free Grammar Checker. Correct all grammar errors and check for plagiarism - instant and free!